Flexi Loop can connect up to 32 safety sensors in series in compliance with the highest performance level PL e. Safety switches and safety sensors with OSSD outputs can be used together, regardless of manufacturer. Detailed diagnostic information is also available for each sensor or switch. 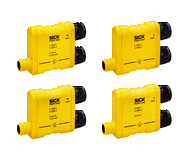 Integrated switching signals allow for the use of interlocks, switches, and lamps. All sensors are supplied with voltage directly from the Flexi Loop. Unshielded standard cables are used with M12 male connectors. Ultimately, Flexi Loop can be relied upon for maximum safety. Connecting sensors in series reduces the amount of wiring and the number of safety inputs in the control cabinet. It also provides a comprehensive diagnostic check of all doors, emergency stop pushbuttons, and sensors. In conjunction with Flexi Soft and Flexi Classic, the entire safety application is able to cost-effectively meet customer needs.